FIGURE 1: Peroxide resistance persisted following germination. (A) Sporulated cells were diluted into YPD media and interrogated with ether treatment. Survival was determined by spotting onto Synthetic complete (SC) plates. The timepoint at which 1 OD doubling was observed is indicated at the 6 hours timepoint and denoted with a red arrow. 10-fold serial dilution of cells is shown. Unstressed – cells germinated without any treatment. DMSO – cells treated with control vector for thiolutin and cycloheximide. Thiolutin -cells treated with 10ug/ml of thiolutin. Cycloheximide – cells treated with 2ug/ml cycloheximide. (B) Extractable RNA levels during germination of cells cultured in YPD are shown. Samples were taken from mid-log cells (Log), spores (SPO), and germinating cells in YPD at 15 min, 1hr, 2hr, 4hr, and 6 hours after release from sporulation. (C) 10-fold serial dilution of H2O2 stress resistance spot assay; Naive represent cells maintained at mid-log and Germ represent cells growing after germination in YPD media. 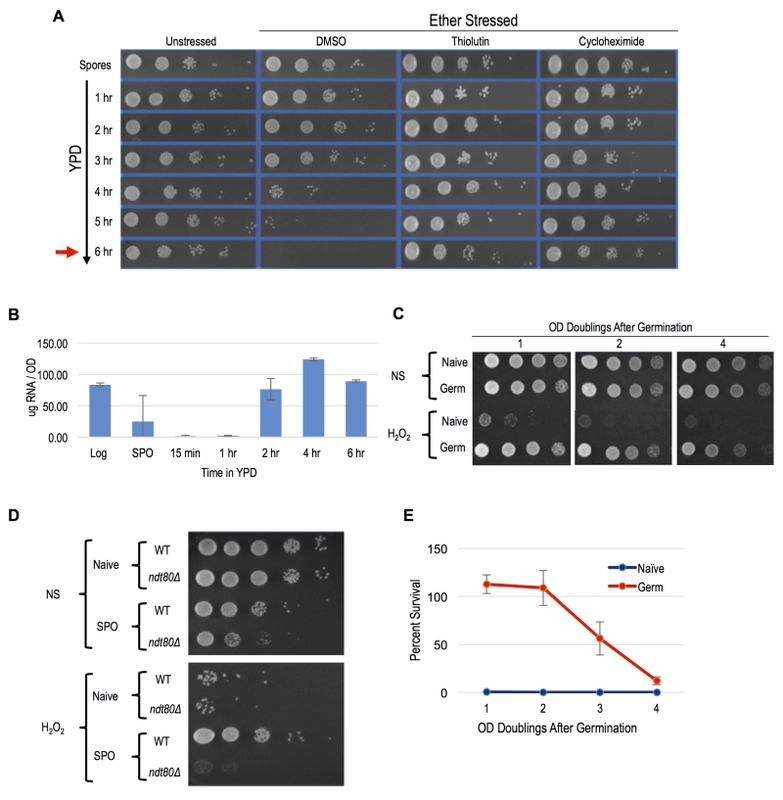 (D) 10-fold serial dilution of H2O2 stress resistance spot assay; WT and ndt80Δ/∆ cells were grown in YPD (Naive) or sporulation media (SPO) and with ( H2O2) or without (NS) peroxide treatment. (E) CFU quantification of resistance to 4 mM H2O2 after germination is plotted. Error bars represent 1 standard error of the mean from 3 biological replicates.